PTZ outdoor camera, 10x Zoom, 80 m. infrared illuminator. All cameras with this logo come with AHD (Analog High Resolution) video output. Some camera is also supporting CVI/TVI, similar to AHD, but used by other manufacturers. These cameras come with a built-in motor which moves the camera on horizontal (PAN) and vertical (TILT) axis. All operations can be controlled remotly by means of keypads or DVR supporting Pelco P/D protocol. These cameras come with 5..51 mm. (10x) zoom lens that the operator can control from remote. AHD technology is the latest development in the analog CCTV industry and is supported by all models in this range. Launched in May 2014 by Nextchip, worldwide leader in DSP for CCTV cameras, AHD technology brings our PTZ analog cameras up to 1MP (HD720P 1280x720) and 2MP (FULL HD 1080P 1920x1080). Before AHD, megapixel resolution was only possible using digital cameras. 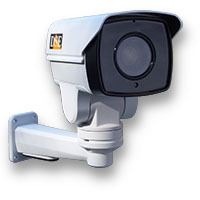 Our range of AHD cameras includes cameras from 1 to 4 megapixel. In order to provide the maximum compatibility with all DVR, most of these cameras are able to support different standards. You can easily change the video format of your camera just sending proper commands via RS485. A few cameras in this range, excep are able to produce a composite video output (CVBS) suitable to any old D1/960H DVR or TV set. In CVBS mode, our AHD cameras provide lower resolution, but still comparable to the best 1000 TVL analog cameras. DSE chose 2 MP SONY EXMOR CMOS sensors for these AHD cameras. Cameras come with 4 maxi IR LED's at 850 nm. which allows 80 m. illumination range. All DSE IR cameras includes double-glass technology. The front glass consists of 2 separate glasses with a splitting ring. The advantage of this solution, much more expansive than traditional rings, is too avoid any possible refraction of the LED's when operating in night mode. Many cameras in this range come with the new stylish black-glass which increase by 8% the LED efficiency at night while reducing considerably the attraction of night insects. Like speed dome cameras, PTZ cameras are wired like normal analog cameras, but require an additional twisted pair for remote control (RS485). This twisted pair connects PTZ cameras to their control units (keypads or DVR). Through DVR, these cameras can be fully managed by remote computers, mobile phones and tablets. Preset can be called by keyboard just by entering the ID number. It is also possible to configure an automatic TOUR (also called CRUISE or PATROL) among several preset. PTZ cameras can monitor large areas by turning continuously between 2 predefined limits, in order to provide a panoramic view. Left and right limits can be easily set by user. 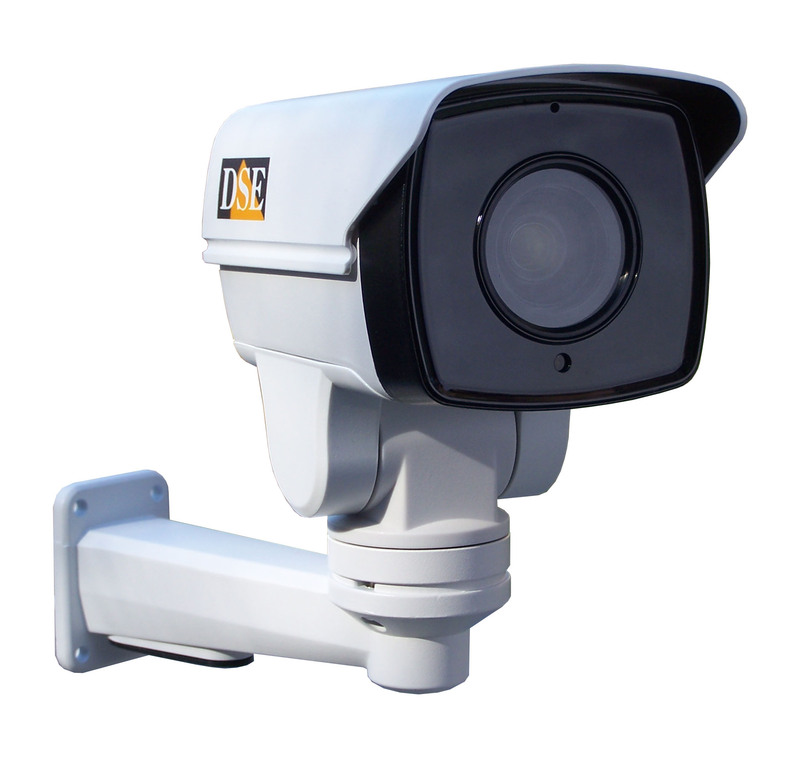 DSE PTZ cameras can record any custom-made sequence that can be re-called by keyboard and executed automatically. This function is generally known like PATTERN recording. Cameras can store one custom PATTERN whcih includes Pan Tilt moves and camera adjustment (zoom/focus). User can set, for each PTZ cameras, a main automatic function (preset, scan, tour, pattern) called HOME function. 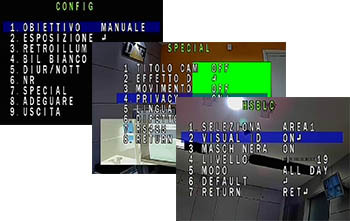 Cameras automatically start the home function if the operator send no commands for a certain period of time. All cameras installed outdoor, especially those where cables run underground or on poles, can be damaged by spikes. These cameras include surge suppressors which protect the units against this kind of spikes up to 3KV. All features in the On Screen Display (OSD) can be scrolled using the RS485 control units. SD-E4HDU cameras also support UTC remote control. All PTZ cameras in the SD range can be controlled using dedicated keyboards with joystick which are very convenient to use. Alternatively they can be controlled using DSE DVR. DVR's efficiently replace the control keyboard and enable remote control by PC or even by mobile phones. DSE PTZ and speed domes commands are based on the very common PELCO P/D protocol and can therefore be controlled with other equipment from other manufacturers. Due to the protection rating, all waterproof cameras come without microphone for audio. Should you need audio function, you can install and waterproof cameras come without microphone for audio. Should you need audio function, you can install and external microphone . These camera are designed to be wall mounted by means of a bracket which is included. Like speed dome cameras, PTZ cameras require 3 kinds of cabling: video, power supply and RS485 control BUS. VIDEO - AHD cameras must be connected to AHD DVR by means of 75 ohm coaxial cable such as CV-RG59 Alternatively, video can be transferred over a twisted pair by converting the signal with video balun. POWER SUPPLY - The camera takes a 12 VDC power supply. To convert 220V mains power into 12 V DC, a min. 3000 mA 220VAC/12VDC adaptor such as RE-AL5 is required. In case you prefer to power the cameras from a single power point you can use a cabinet power supply unit like RE-AL15. 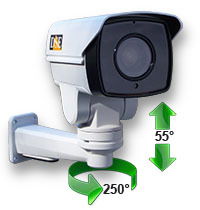 RS-485 - PTZ cameras are controlled by means of a twisted pair cable (RS485 BUS) that connects all cameras in series and can be up to 1200 m. long. Each camera has its own ID code, so can be controlled independently. Up to 256 camera can be connected on one bus and controlled from remote using control keyboards or DVR. The classic LAN network cable CV-CAT5E is very convenient for wiring PTZ cameras. It includes 4 twisted pairs to carry video (with balun) + power + RS485 on a single cable. In case you cannot use hardwire cabling you can consider our RE-DTX3 digital transmitter which can send video (CVBS only) and RS485 controls without wires. NOTE: Waterproof hard-wired cameras come without 12VDC power adaptor which must be ordered separately.